Oh Snap! The Friggin Amazing J.Ho Sketchblog...: Surprise! A Nerdy Fan-Art on a Friday Afternoon! For the uninitiated, this is kind of a complicated one. In the She-Ra cartoon, the bad guys were a totalitarian regime known as "The Horde," and they were lead by a cyborg-ish guy with a skull-like face named Hordak. Skeletor, incidentally, was originally Hordak's apprentice, but I digress. Hordak's boss was an entity named "Horde Prime," who was also supposedly Hordak's brother. The only pieces of Horde Prime that were ever seen by the viewers were two glowing eyes and his gargantuan metallic hand (whether armored or robotic, we don't know). And the only reference to his appearance mentions that he has two heads. Aside from the cartoon, there are also one or two minor and completely contradictory appearances of Horde Prime in the UK comic books. And this is what got my geeky little brain rolling. 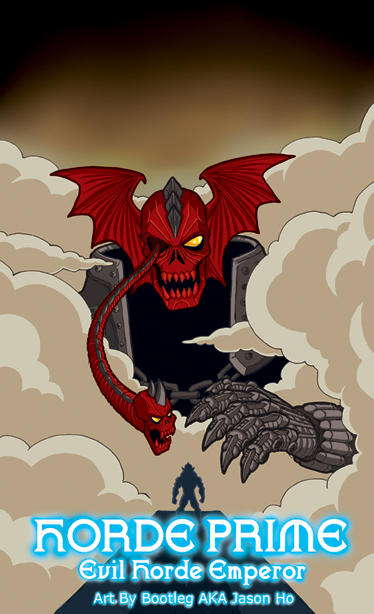 The basic assumption that I make in my illustration is this: it is not Hordak's face on the Horde emblem. For my version, the armor was based on the UK comic book version, while the hand was based on the cartoon depiction. His head and face are, of course, based on the Horde symbol (or by retro-continuity, the basis for the Horde Symbol). As for the secondary head, I just wanted to give him his extra head in an unexpected way. Oh, and I assume that Horde Prime is, like Hordak, a shapeshifter, so the secondary head can retract and morph back into an eyeball. I view Horde Prime as Hordak's brother, who started out roughly-human sized like Hordak--over time, his shapeshifting abilities developed further, and eventually he was able to use his powers to increase his size. Man, as much as I watched He-Man (and She-Ra!) and as many MOTU and Evil Horde figures as I had... I feel like I don't remember a goddamn thing about any of it once I see people talking about it online. thanks mark. my memories of he-man and she-ra are pretty fuzzy--but watching the recently released dvd's has really brought back a lot of it. transformers, on the other hand, i remember perfectly!